Our mission is to provide you with the most satisfying experience in achieving your physical therapy goals and giving you your money's worth. As you all are aware every year, you as a consumer are bearing increasing financial responsibility for your health benefit. We provide you with one-on-one sessions with the same therapist to allow for continuous and consistent care. You are not a number at our facility, but rather an individual with individual needs and goals. 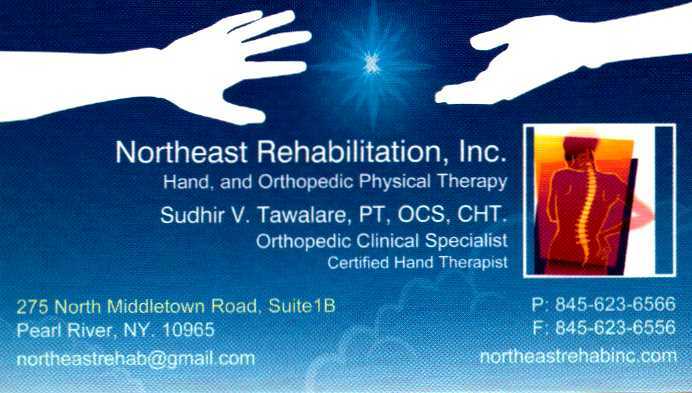 We specialize in Hand, Orthopedic and Sports Physical Therapy. In order to take advantage of our services, you will need to bring a prescription for physical therapy from your physician, and, if required by your insurance company, a primary care physician referral.﻿ On your first visit, you will receive a thorough evaluation, and the therapist will explain your prognosis and help set realistic therapy goals for you.